Mike Miller of the Peoria Park District teamed up with Maury Brucker, Conservation Chair of Peoria Audubon Society, to organize and host a birding trip along prime backwater sites of the Illinois River south of Peoria. JD Russell and Mike Ingram of the Park District volunteered to assist with logistics and driving the vans. 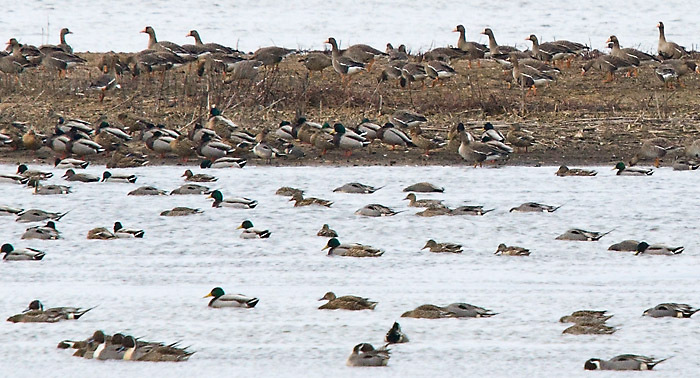 This trip has become an annual Spring and Fall event to showcase all the migration and abundance of waterfowl in Central Illinois. 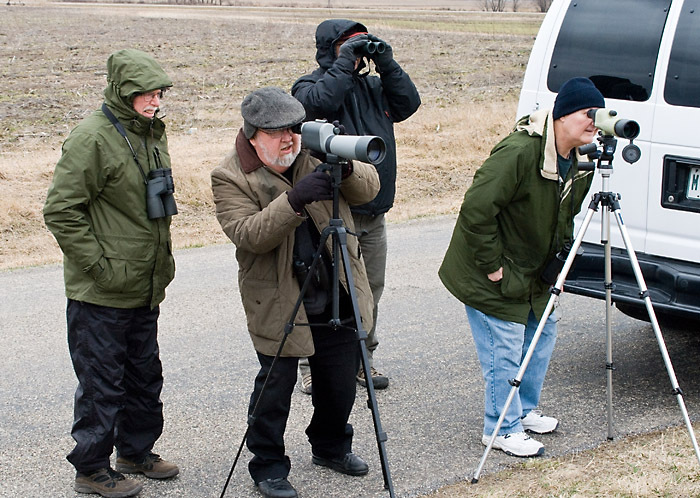 The Peoria Park District provided two 15-passenger vans and a smaller van with food and drinks for a day of birding. 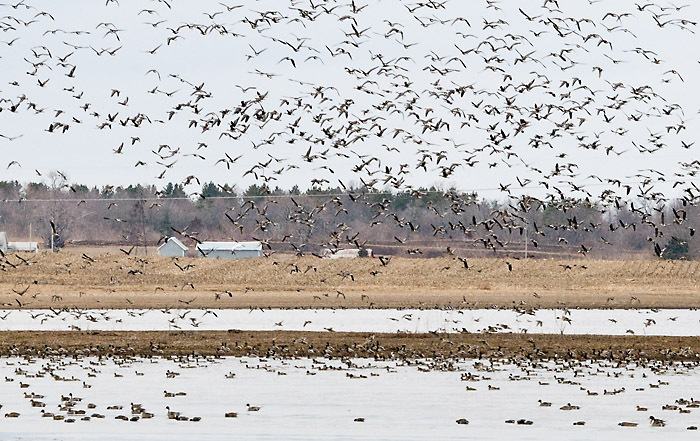 The timing of the March trip was chosen to match the northward peak of migrating waterfowl. This year, unlike the cold winter of last, temperatures have been quite mild with no ice on the waters. Although the sky was somewhat gloomy and overcast, everyone had a good time getting out to look at the ducks and geese. In order to maximize the opportunity to view ducks and geese, Maury and Mike scouted the area the Friday before. This year, the three main areas we visited were Spring Lake; the Sand Lake area near Havana, IL; and the Emiquon Restoration. Dennis Endicott of Peoria Audubon Society, who also serves as webmaster, took photos during the trip to share. First up was a stop at Spring Lake, where there was a significant amount of wetland habitat set up specifically for migrating ducks. 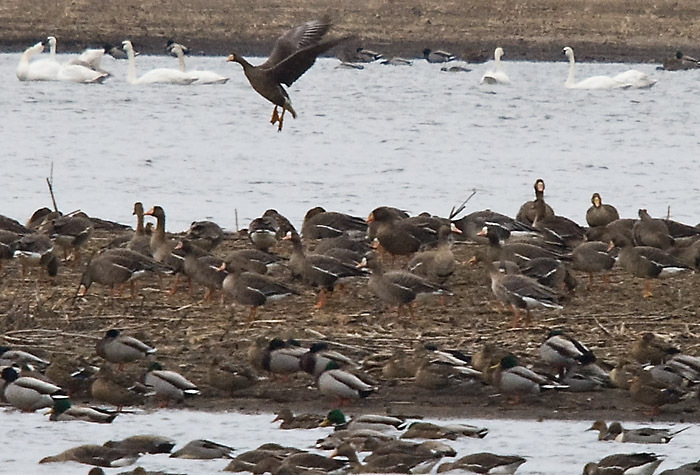 In the above image, a large cluster of Mallards were acting rather skittish as they looked around for any disturbance. 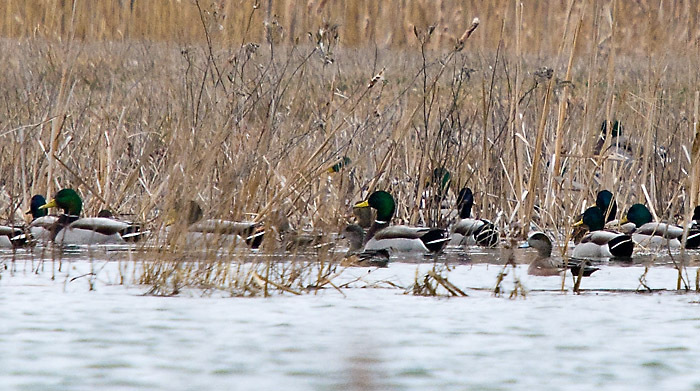 Note the presence of a pair of Green-winged Teal (on the middle and right right foreground) swimming along with the slightly larger Mallards. The ducks were clearly at home with the shallow wetland vegetation. 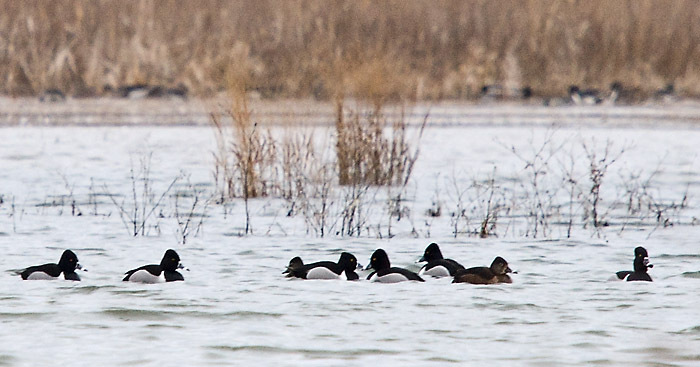 In one of the more open wetlands, Ring-necked ducks were swimming around. Note the presence of the Bufflehead with the Ring-necked ducks. 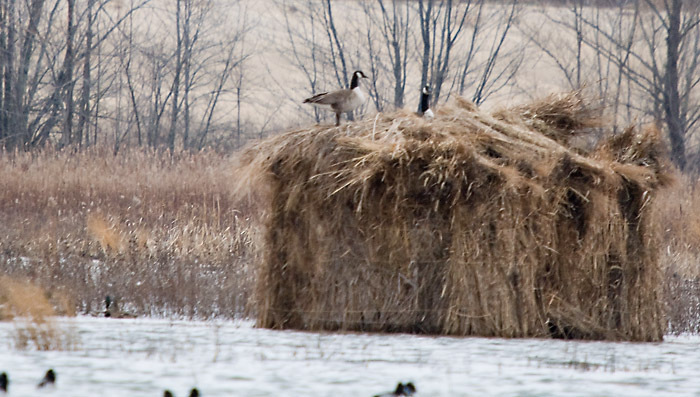 The group thought it was an interesting irony that a pair of Canada Geese took up residence on the top of the Duck Blind that had been erected in the Spring Lake wetland. In the above image of Ring-necked Ducks, the stark black & white markings of the male contrast with the more subdued browns of the female. In the path along one of the canals at Spring Lake, a banded Mute Swan very close to our van as it passed. 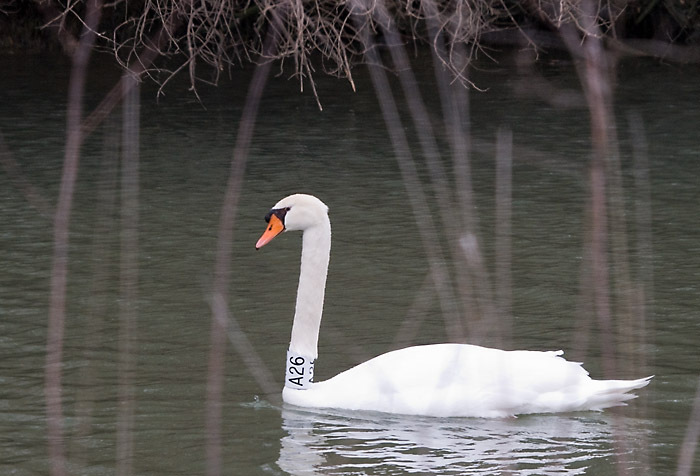 Several of the Mute Swans viewed during the day had the characteristic neck band, indicating that the population was being likely studied by the Illinois DNR. Maury indicated that Mute Swans are not native to the US and is an aggressive species that may compete for limited resources. If the population starts to expand, at some point, the high numbers may displace the populations of native species. As we drove along Spring Lake, we came across a Bald Eagle, that had not yet acquired the white feathers of the adults. The classification as an Immature of the 2nd or 3rd year, comes after the classification as a Juvenile the first year. 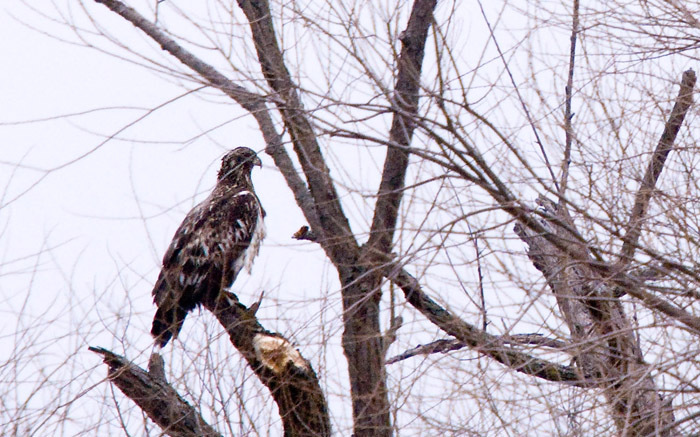 At this stage, the young eagle is starting to have a few white feathers on the head and back. Maury indicated this bird is likely 2-3 years old. Near the road at Spring Lake, a pair of Mute Swans were very busy building a nest from material slightly submerged in the lake. In this instance, the banded above individual appeared to be doing most of the building. Our van stopped and watched for a few minutes as he would take beak after beak of material and continue to create the pile shown below. Most of the activity was coming from the Mute Swan on the right. We couldn't tell what the other one was doing. There were a few comments in our van about the division of work between the men and women. As we continued to drive very slowly along a canal at Spring Lake, we saw a couple of Hooded Mergansers in the distance. They were too skittish to wait for a calm clear shot. 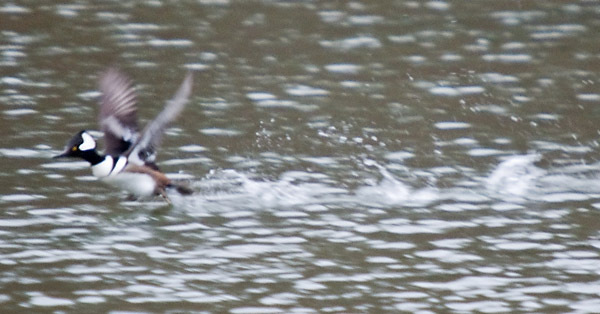 The above blurred image of the male Hooded Merganser building up speed for flight was the only one that almost came out. 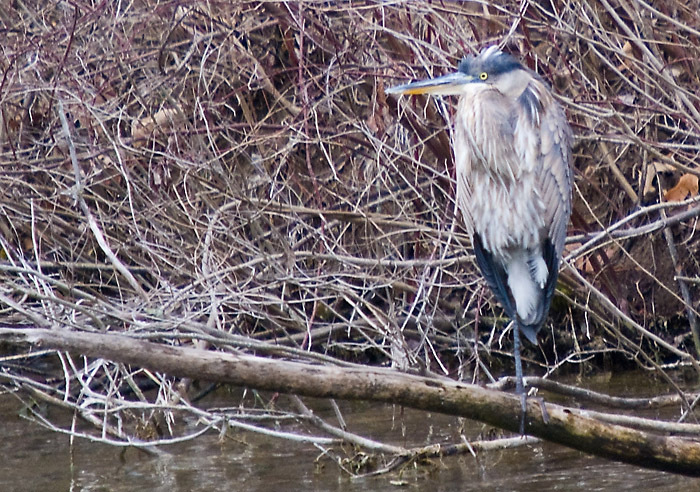 While at Spring Lake, the above Great Blue Heron seemed to be soaking up the warmth of the sun. 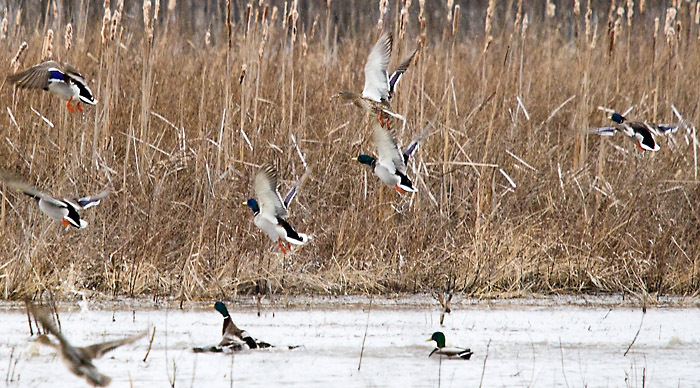 Several times as moved ahead at Spring Lake, we flushed small flocks of Mallards. 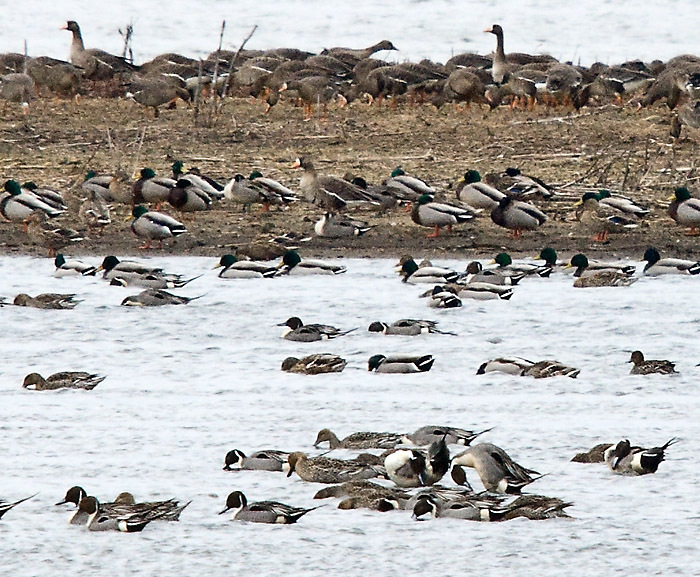 With the overcast gray skies, the above image was one of the few times that the Mallards were not too blurred to see. 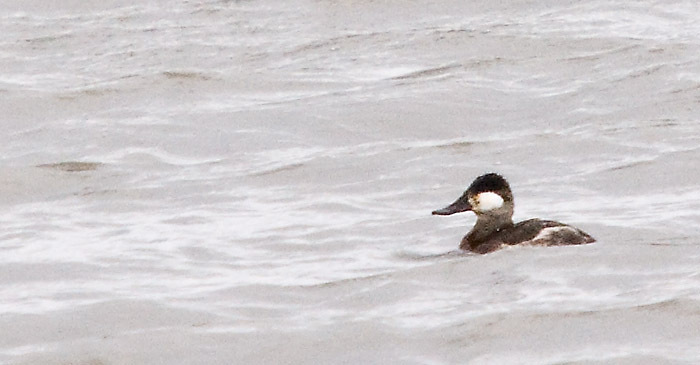 We saw several distant Ruddy Ducks at a few places at Spring Lake. The above image is highly cropped due to the distance. About 1-2 miles east of Havana, IL, after a wet spring, sometimes the water table becomes so saturated that the water rises in nearby fields. Locally known as Sand Lake, this temporary lake turned out to have a large number of migrating water fowl. Many of the ducks would occasionally take to the air. 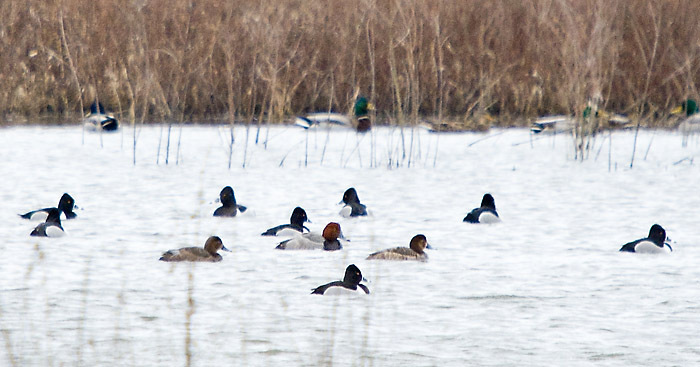 In the foreground of the above image, most of the ducks are Northern Pintails. Note that the wind is coming from the south; left to right in the image. 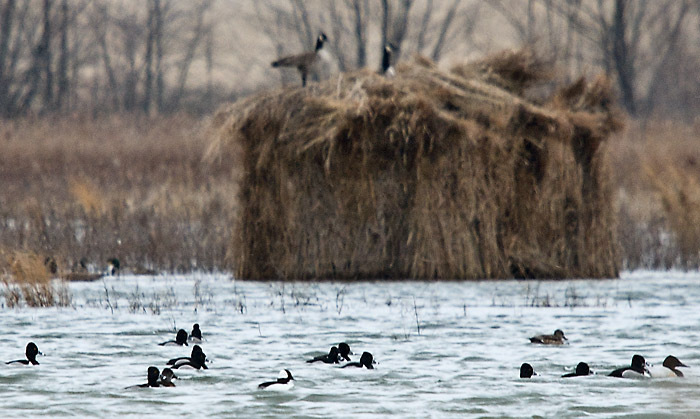 As the Pintails were foraging, the ducks had their heads into the wind. Note the White-fronted in the background. These geese, with the orange legs, were perhaps 1/4 mile away from our group in the image. Note that the nearby Mallards also have orange legs. 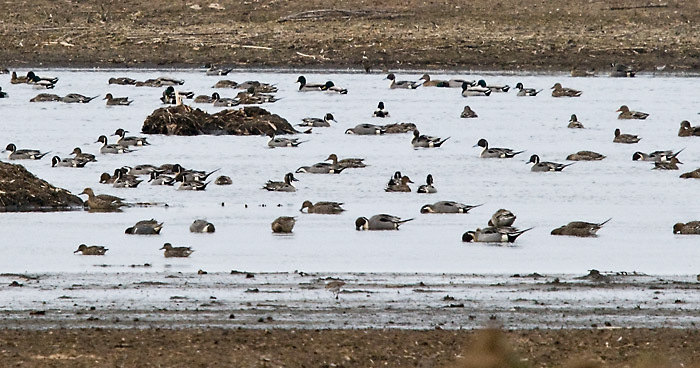 The above image also has a few of the Northern Pintails, Mallards, and Greater White-fronted Geese. In the image above, a Greater White-fronted Goose is coming in to land. Note the Tundra Swans in the background. The clearest way to identify these species from the Mute Swans seen at Spring Lake is from the black bill on the Tundras. 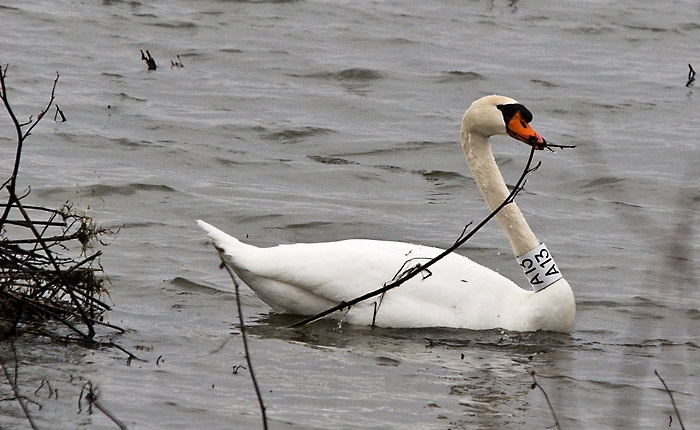 Mute Swans would have had an orange beak with black basal knob. Clearly, the Tundra Swans were busy migrating back to the far north to nest. Everyone had to bring out the spotting scopes to have a good view at the distant ducks, geese and Tundra Swans. 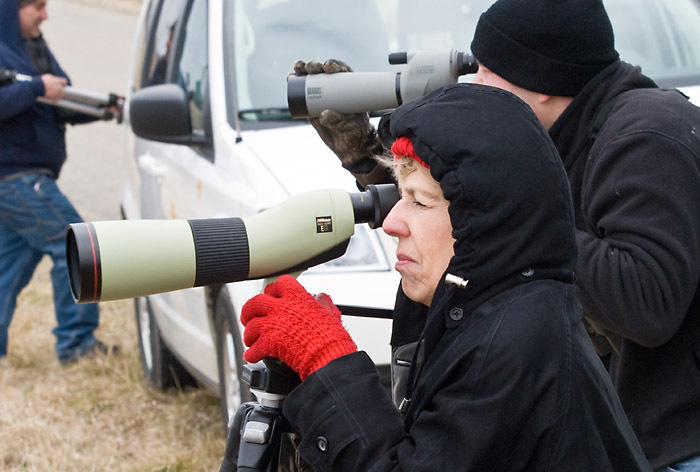 As everyone looked through the spotting scopes, they had to keep bundled up as the 20 mph wind kept the 35-38 °F temperature on the blustery side.